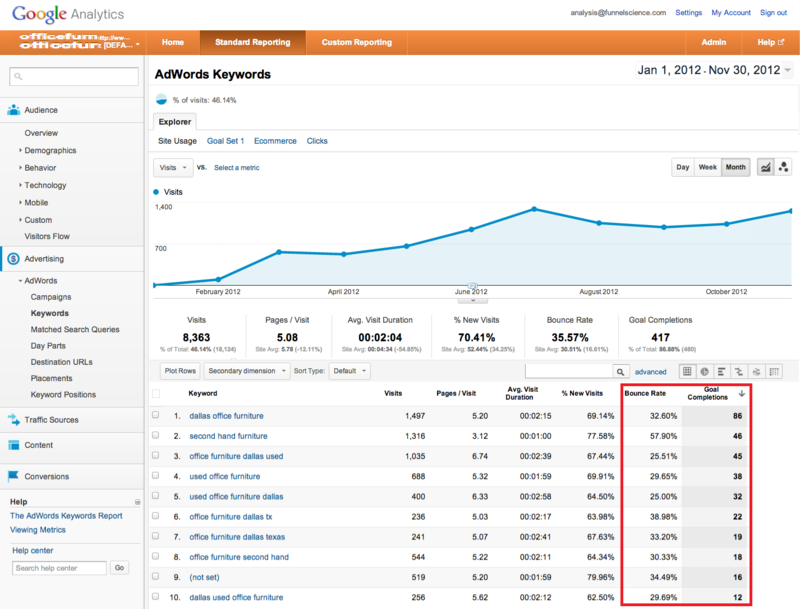 100% Bounce Rate in Google Adwords is a Serious Problem. Bounce rate means that a visitor came to your site, looked at 1 page, then left. If your paying per click, 100% bounce is an expensive problem. The target bounce percentage for your Adwords traffic should be 30% or lower. Bounce rate is an important metric for user engagement; a potential customer must be engaged if they are going to make a purchase. It is the job of your marketing and website to engage the customer and when you are failing, you will have a high bounce rate. The reason your paid traffic should have a lower bounce rate compared to organic is because you control which keywords bring you clicks and you control which landing page they will arrive. If you are too broad with your keywords, you will have completely irrelevant Search Terms which will equal low quality visitors. Or if your very focused and specific keywords are going to a generic page, this will also cause high bounce rate. Is There Ever A Situation Where 100% Bounce Rate is OK? From time to time a very experienced marketer will make the argument that 100% bounce can be expected and that it isn’t always a negative. Although it is possible, not very likely. In any event, that means that you not setup your anlaytics the best way for your case and not accurately measuring bounce rate. Phone tracking can occur by loading a “virtual” page which causes the website to fire a hidden page and can cause 100% bounce rate. This is the only example that should ever be accepted for 100% bounce rate. But these may need filtering to prevent misleading reporting. 3rd – party Call To Action If you are using 3rd-party tools in your website, there is a possibility they will cause a high bounce rate. If this is the case, you should question the need for the tool and if it was designed to increase the user engagement. If not, get something that engages your customer. If the tool does not allow for Google Analytics integration and tracking, I would recommend that you find a better tool or have it made so that it can track your customers engagement.